This sectional is a lush seating option for your living room, den, or entertainment area in your home. 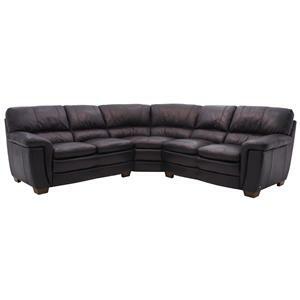 As a fully customizable piece, this sectional can be used with or without the optional legs, and can be found in a variety of leathers and colors. With plush rolled pillow arms, intricate stitch detailing, and all around comfort, bring this relaxing and quality sectional into your home today. 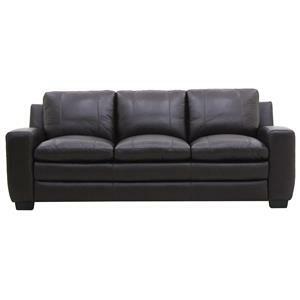 This contemporary black leather sofa will be a great addition to your home. 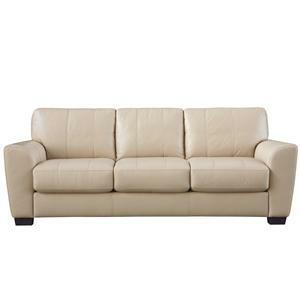 The plush high back cushions and pillow top seat cushions make this sofa comfortable. Sleek track arms and square legs give this stylish piece a fresh look. This cozy piece will be stylish in your living room. Get the comfort and function you want from your lounge decor while maintaining a contemporary aesthetic with this Queen sofa sleeper. Plush cushions and spaciousness make this sofa the perfect piece for lounging away while you watch a movie or chat with friends. Large track arms and simple tapered block feet exude modern style, while contrast stitching on the seat and seat backs creates a more refined look. Complete your living and entertaining area with the sophistication of the Contrast Stitching Sectional Sofa. Configured in a design that is convenient, cozy, and cool, this sectional adds casual class to any room with its presence. Split back seat backs lend visual detail to please and decorative contrast stitching brings a charming, handsome touch to the simply stlyled sofa. Plush pillow arms provide for comfort for the big game on Sunday, movie night Saturday, and lazy afternoon naps. 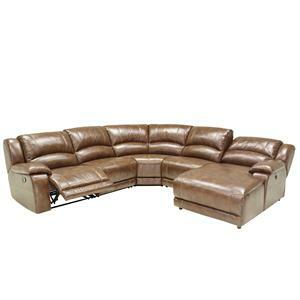 Host a party or movie night with this expansive sectional sofa. Composed of a variety of reclining and stationary pieces fit effortlessly together, this sectional offers style, comfort and storage all-in-one. 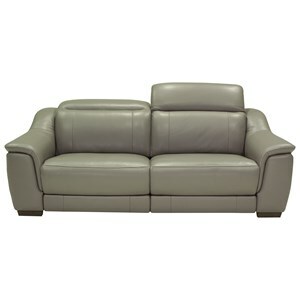 Mark by lush leather upholstery over pad-over-chaise seats, bustle backs and pillow arms throughout, this item is sure to keep everyone feeling cushioned and supported. 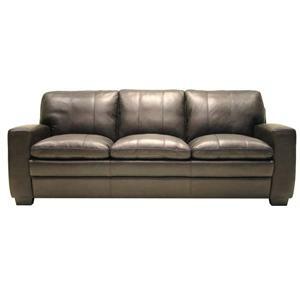 Relax in sleek contemporary style when you bring home this power reclining sofa. This sofa features a contemporary look with defined lines balanced by generously plush cushions that promise comfort as you relax in your home. Independently control the footrest and headrest for a completely customized position every time you enjoy those piece. If you're looking for a living room seating piece that offers a great balance of comfort and style, don't miss this sofa. 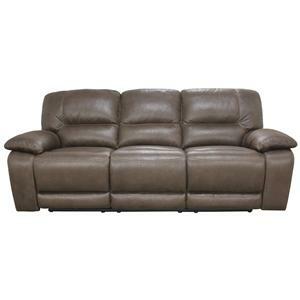 Enjoy the comfort of this 100% top grain brown leather loveseat with two power reclining ends. 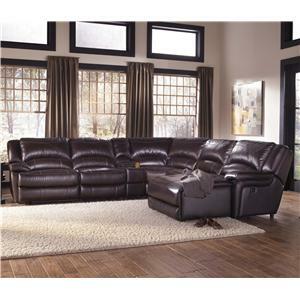 Each oversized end of the loveseat offers spacious seating room with a recliner and highly padded arms. It makes the perfect place to relax as you watch TV or work on a computer. Pair this reclining casual contemporary loveseat with the coordinating reclining sofa for a great seating group for your home's living room, family room, or den. This leather chair offers a cool and transitional design. It features one seat cushion with a fibre back rest cushion and traditional rolled arms. The rolled arms are accentuated by decorative nail head trim for a stylish touch. Exposed wood feet are featured in the front and rear for a finishing touch. 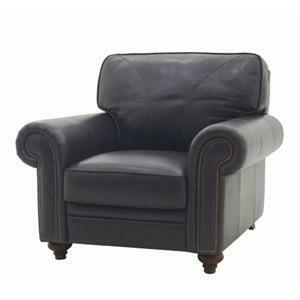 Complement your living room with the beauty and classic style of this accent leather chair. 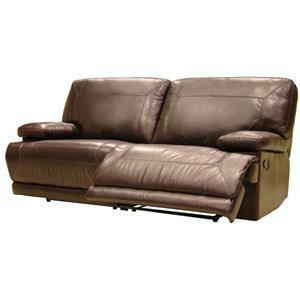 This casual power reclining sofa has an elegant look with a slight country style. Designed to complement family rooms while providing a luxurious reclined comfort, this sofa features an up to date style with wide-set track arms and visible seam stitching. Plush upholstered seats, backs and arms complete this piece with a comfortable sitting experience of luxurious relaxation. Place this piece in casual and transitional room settings, alone or with its (un-pictured) reclining loveseat and chair. A VISION DRIVEN BY PASSION – Starting out purely from the love of creating beautifully crafted and designed products, HTL has grown into a family of 8,000 strong, capable of enhancing our worldwide presence. Artfully blending innovation and comfort, our leather-upholstered creations put world-class quality within easy reach. Born from sheer talent and flawless workmanship, our designs embrace every aesthetic - from heritage to modern, from lavish to minimalist. Starting as a modest sofa maker in 1976, HTL has grown to become one of the world's leading manufacturers of leather sofas and leather upholstery hides. Listed on the Singapore Exchange since 1993, we are a transnational company focused on the business-to-business sector. Along with a team of more than 7,500 employees, we have fully integrated manufacturing facilities in China, plus marketing offices across the globe. And our quality products are marketed to more than 40 countries, through our vast network of sales partners and retailers.